You know how to fill up your gas tank, how to turn on your car, and how to push your brake and gas pedal to stop and go. Unfortunately, though, that’s about as far as your car expertise goes — and the mechanic knows it. Face it: your car will eventually break down, and you’re going to have to put your trust in a stranger to fix it. And when it comes to strangers, many mechanics seem to be the greediest when it concerns taking your hard-earned cash. 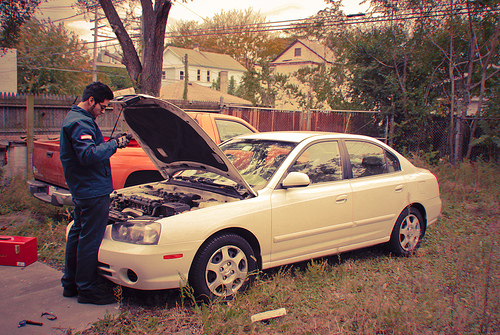 With that said, here are six steps to help you avoid getting ripped off by your mechanic. Sure, your knowledge of cars might stop at being the driver of one, but that shouldn’t preclude stepping out of your comfort zone and getting your hands dirty. There are a lot of issues with cars that are easily fixable if you have a car manual and the necessary tools. Do-it-yourself auto repair is relatively easy with a Chilton’s manual, which provides in-depth directions on how to fix most problems on many makes of models of cars and trucks. If you’re not adventurous enough to try to fix the problem yourself — or if you tried, and the repair is just too big a job — the next step is to start looking for a mechanic who’s credible for the right price. Considering that everyone has to get their vehicle serviced or fixed from time to time, the best way to find a local shop worthy of your business is to ask family members and friends for their opinion and references. They’re likely to point you in the right direction. If your family members and friends don’t know a reliable mechanic — let’s hope that’s not the case — then it’s time to start doing your own investigative research. In the world before the Internet, this was a lot harder to do. With the Internet, though, you have an unlimited amount of resources at your fingertips for finding out which shop is shady and which one is trustworthy. If you really want the best of the best, consider getting a consumer report. Resources like the Better Business Bureau and Angie’s List are also good for doing your homework on a potential mechanic. Once you find a shop and walk through the door, the mechanic will love to hear nothing more than “Do whatever is necessary to get this car driving!” Translation: “my money is your money, no matter how much.” Although you might not have the know-how to fix the car, you shouldn’t let that intimidate you from talking with the mechanic and asking detailed questions. After all, you’re paying them to do the work, not vice versa. Before you and the mechanic agree on the work they’ll do on your car, make sure what’s getting done, what’s included in the cost, and how much it’ll be after parts and labor. They legally can’t start work until you sign off (if fact, you’re entitled to ask for a written estimate in most states), so if anything seems fishy, this is the stage where you need to ask the right questions. Don’t be surprised if the shop asks for wiggle room on the estimate just in case something unexpected happens, either. No matter the case, put it all in writing and make sure you and your mechanic sign off on it. That way, if anything happens, you have proof or price. You want to make sure the mechanic shop you go to works on all type of vehicles, whether it’s luxury suvs or older model compact cars, and you should make sure they offer a warranty on the work they do. This guarantees that the shop’s work will happen in the best interest of keeping the customer satisfied as opposed to filling up the cash register in the fastest amount of time. Additionally, make sure you keep all receipts and warranty paperwork in a safe place for future reference. Do you have a trustworthy mechanic shop you can count on? What are their best qualities? Share your experience with other readers of the blog in the comments section.